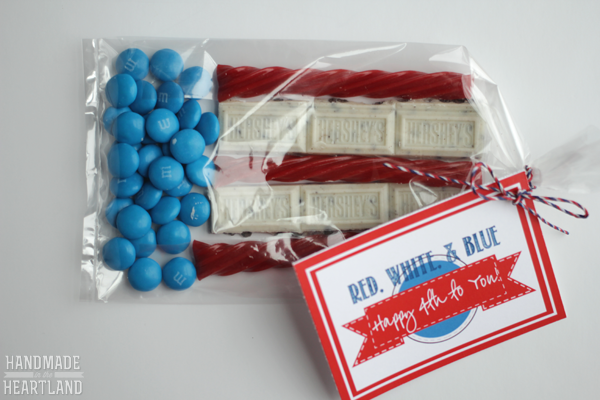 Flag Treat Bags for the 4th of July! 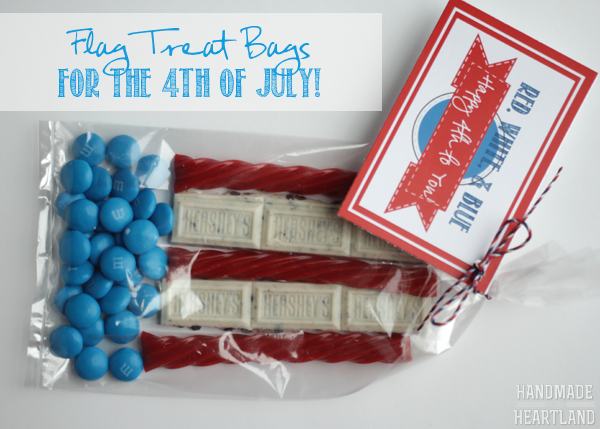 Home Holidays 4th of July Flag Treat Bags for the 4th of July! 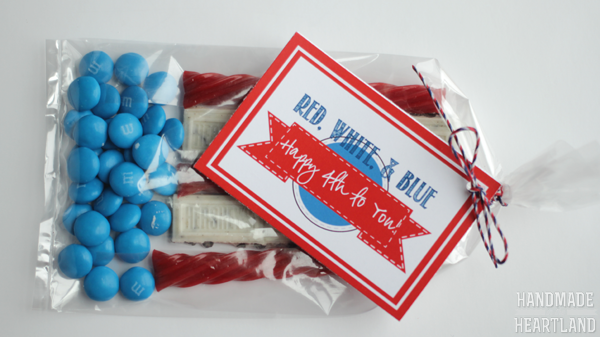 I do love a cute treat with an even cuter printable, so I designed this fun flat treat bag for the 4th of July for you. I originally tried to coat twizzlers in white candy coating to make the white stripes but the candy coating kept flaking off the the twizzlers so it didn’t look so pretty. 🙂 So after standing in the candy aisle for too long I decided to use Hershey’s cookies ‘n’ creme bars and I love how they turned out. So if you need a cute little snack to take for munchies while enjoying fireworks these are the perfect little treat! First step gather your supplies: Twizzlers, Cookies n Creme bars, blue M&M’s, cellophane bags, the printed out tags and some twine. 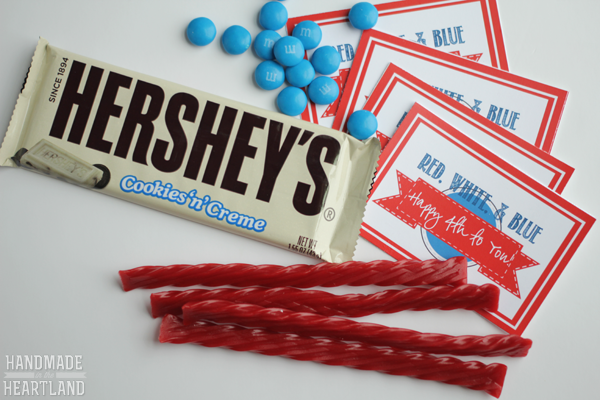 You can download the red, white & blue free printable HERE . I printed mine out at office max on card stock because their printer always prints out with brighter and more saturated colors, you can also print it out on your home printer. 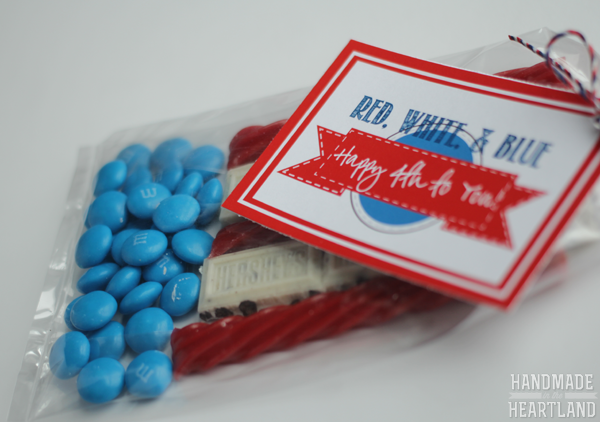 To assemble the bags first put the blue M&M’s in the bottom of the cellophane bag then put in your twizzlers and chocolate bars. I had kind of a hard time cutting the chocolate bars, they kept breaking! I would not recommend cutting with a knife just carefully break with your fingers. 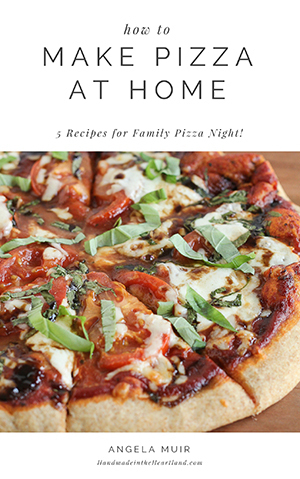 My husband mentioned after the fact that freezing them and then cutting my be easier, you could try it but I don’t know if it would work or not. let me know if you do! Do you watch fireworks in your city or do you buy a bunch and shoot them off in your neighborhood? Do you do the same thing every year or switch it up? I’d love to hear in the comments!